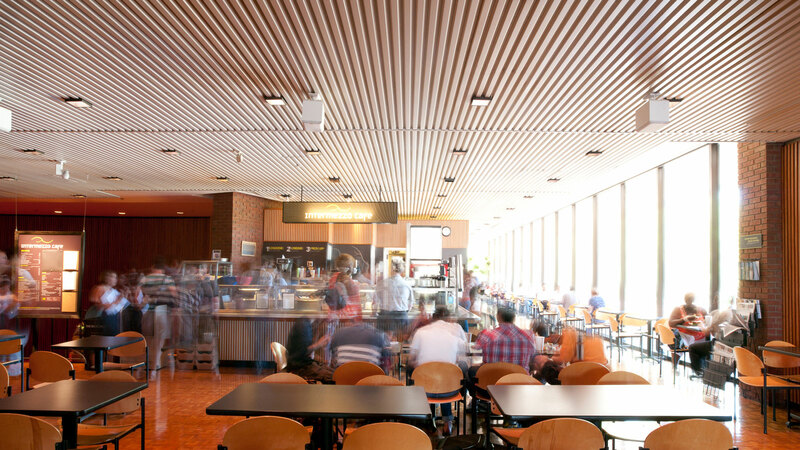 Make your visit to Krannert Center complete with a meal from Intermezzo or a drink from the Stage 5 Bar. Intermezzo serves up freshly baked breakfast goods, light lunches, hearty dinners, vegetarian and non-vegetarian fare, delectable treats, yogurt, fruit, and coffee, with many items sourced from small family farms. The Stage 5 Bar in the Lobby is an open space to hang out, get in some study time, meet someone, hold a meeting, or just relax. You can feel especially good about your purchases (and maybe a little less guilty about splurging on a cookie) because all of the proceeds are invested right back into the events you see on Krannert Center stages. Order before the performance to have your selection waiting for you at intermission! The full dinner menu is served until performances begin; desserts and beverages are available at any time. Grab a cocktail, sip a beer, or sit down for light hors d’oeuvres to share with your group. No matter what you’re hankering—a slice of red velvet cake with a cup of decaf, a crisp salad, or a glass of burgundy—you can place an order before you head inside the theatre and we’ll have it waiting for you at intermission or after the show. JOIN THE INTERMEZZO EMAIL LUNCH LIST! Sign up today to get the daily specials, information on new menu items, and updates on our green initiatives. Skip the flimsier options and invest $15 in a Mezzo Mug—and we’ll fill it up for free! Bring it back for a refill of one of our coffee blends, hot tea, iced tea, or a soft drink for the refill price. It’s a sensible purchase that’s good for your budget and good for the planet. Our gift cards never expire and can be redeemed at any trip to Intermezzo or the Stage 5 Bar. Use them for purchases at Promenade, Intermezzo, and the Ticket Office too. They’re available for sale at Promenade and the Ticket Office, and you can also find them online. CenterChecks are still good and will be honored forever, with encouragement to come in and trade them for gift cards. Our in-demand buffet-style dinner service is served before select performances. Choose from slow-roasted, hand-carved prime rib or roast pork tenderloin with creamy dijon sauce for $14.95. You’ll receive red-skinned mashed potatoes, fresh steamed vegetables, and rolls with your entree. Service typically begins at 5:30pm and continues until 7:30pm. Dine before attending the Chicago Symphony Orchestra. Better still: many ingredients are locally produced, we feature organic selections, the containers are biodegradable, and the takeout boxes are made from corn-based recyclable products. Because of efforts like these, Intermezzo has earned Green Business Certification from the Illinois Green Business Association by meeting or achieving program standards in energy conservation, water conservation, waste reduction and recycling, pollution prevention, transportation, landscaping, general employee practices, purchasing, and community development.